Dolphins are very intelligent aquatic marine mammals. There are places where they attract huge crowds displaying variety of acts – they are considered very friendly to humans. The longest river in Asia, ‘Yangtze River’ flows entirely in China providing a rich river basin to the land with highest population. The Yangtze is the sixth-largest river by discharge volume in the world. Like many other rivers, Yangtze plays a large role in the history, culture and economy of China. It is habitat to many species including the Chinese alligator, the finless porpoise, the Chinese paddlefish, Yangtze River dolphin or baiji, and the Yangtze sturgeon. The baiji (meaning "left behind") has been considered extinct species of freshwater dolphin formerly found only in the Yangtze River in China. Nicknamed "Goddess of the Yangtze" – it was regarded as the goddess of protection by local fishermen and boatmen in China. The baiji population declined drastically in decades as China industrialized and made heavy use of the river for fishing, transportation, and hydroelectricity. It was feared that baiji could be the first dolphin species in history that humans have driven to extinction. Though efforts were underway, they failed. Researchers have failed to find the animal and the presence of them have been lesser and lesser with many believing that the last known Baiji named Qiqi died in 2002. The demise of the beautiful river creature has often been described as one of scientists' most significant failures to respond to an environmental crisis. The Yangtze River dolphin was declared extinct in 2007, after a survey led by the Zoological Society of London failed to locate any specimens – either spotting them or hearing their distinctive whistles under water. The mammal had a highly developed sonar and reduced eyesight – two characteristics consistent with the fact it had to navigate through murky waters. Now there is sizzling news that Chinese conservationists believe they may have caught a rare glimpse of a freshwater dolphin that was declared functionally extinct a decade ago having graced the Yangtze river for 20 million years. At a time when Scientists and environmentalists had almost abandoned hope that baiji, could survive as a species after they failed to find a single animal during a fruitless six-week hunt along the 6,300-km (3,915-mile) waterway in 2006, a sighting by a team of amateur conservationists gets reported near the city of Wuhu in Anhui province. “No other creature could jump out of the Yangtze like that,” Song Qi, the leader of that expedition told Sixth Tone, a government-backed news website. “All the eyewitnesses – which include fishermen – felt certain that it was a baiji.” Song told the Guardian the unconfirmed sighting occurred during a seven-day search mission down the Yangtze that began in the city of Anqing on 30 September. On 4th of October, they spotted a “white dot” emerging from the river. Soon after a “white light” appeared to puncture the surface of the water for a second time. Seconds later Song spotted what he believes was the baiji for the third and final time, swimming towards the river’s eastern bank. The amateur conservationist, whose day job is as a publisher in Beijing, admitted he was not a baiji specialist and could not be totally sure the animal he had seen was the aquatic mammal. His group captured no images that might conclusively identify it. But Song said local fisherman who had also seen the creature were “100% certain” it was the baiji. 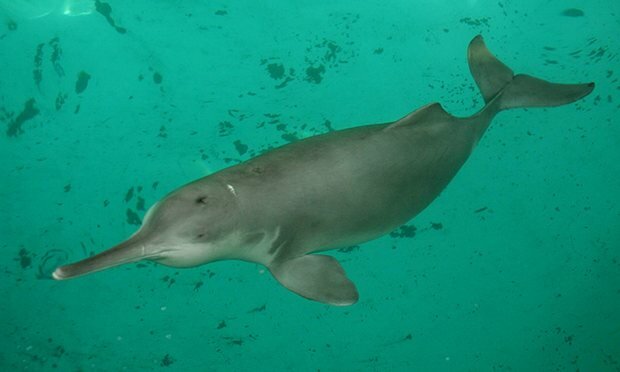 With the apparent confirmation of its demise, the narrow-beaked river dolphin has become a symbol of the devastating environmental price China has paid for decades of unbridled development. In the 1950s, the Yangtze is thought to have been home to thousands of such animals. But by the end of the 1980s that number had fallen to perhaps 200 thanks to a lethal cocktail of dam-building, over-fishing, pollution and boat traffic. By the turn of the century just 13 remained, according to one survey. In his book about the baiji’s plight, Witness to Extinction, biologist Samuel Turvey described how thousands of years of human activity had decimated the Yangtze basin, a bio-diverse area once regarded as the Amazon of the East. As well as the baiji, the ecosystem was once home to two species of rhinoceros, elephants, gibbons and giant pandas. All have now disappeared. During the Great Famine of the late 1950s, when tens of millions of Chinese people starved to death as a result of Mao Zedong’s rule, “the goddess of the Yangtze became lunch”, Turvey wrote. “It was the dolphins or it was our children,” one Yangtze fisherman is quoted as telling a Hong Kong journalist. “Which would you choose?” More recently, shipping and catastrophic levels of industrial pollution have taken their toll. China’s official news agency, Xinhua, this week reported that more than 400,000 “chemical enterprises” were operating on the Yangtze’s middle and lower reaches – around half the country’s total. A solitary baiji might revive hopes ~ yet, the situation is far from satisfactory – and China is not alone in that aspect. Situation here and in many other countries is not any different when it comes to pollution, contamination and mindless constructions.